Auckland is home to one of New Zealand's premier shopping areas and has countless malls and exceptional facilities, both in and around the city centre. Shopping in Auckland is likely to be a real highlight for many holiday makers visiting the North Island. The main retail areas in the city can be found around Albert Street, Anzac Street, Broadway, Chancery Lane, Customs Street, Elliot Street, High Street, Newmarket, Ponsonby, Queen Street, Victoria Street, Wynyard Street and Karangahope Road - also known as K' Road. 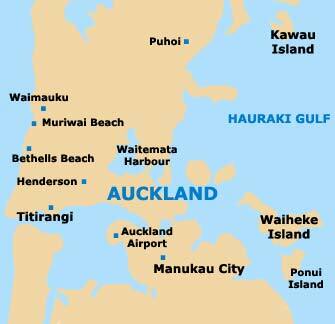 Auckland features many international high-street names, huge department stores, independent shops and speciality outlets. Many of the biggest names in high-street New Zealand shopping, fashion and jewellery can be found in the city, which is well-known for its high concentration of designer fashion boutiques. With so many shopping centres, malls and well-laid out pedestrianised districts, Auckland has a truly world-class variety of shops and weekly markets, regularly attracting thousands of bargain hunters from all the city. Most shops in Auckland are open from 09:30 to 18:00 on Monday, Tuesday, Wednesday and Saturday, usually staying open until 21:00 on Thursday and Friday. Sunday trading now sees most retail outlets remaining open until around 16:00 on Sunday. The Atrium on the central Elliot Street is a large mall, with a vast range of shops, including fashion outlets, book stores, gift shops selling souvenirs and a large food court. DFS Galleria Customhouse is a vast mall, with four floors of fashion boutiques, jewellers, bureau de change outlets, food stores and duty free shops. The Downtown Shopping Centre in the Central Business District (CBD) is overflowing with all kind of shops, such as fashion stores, shoe shops, banks, florists, gift shops and food outlets. 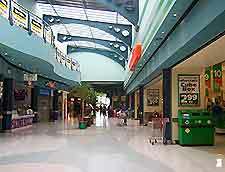 The Manukau Centre is an enormous complex to the south of the city centre, with around 120 shops, supermarkets, department stores and a large food hall. Queen's Arcade is a historic arcade in the heart of the city centre, with two floors, a number of interesting speciality stores, food shops and cafés. Shore City Galleria, on the North Shore of Auckland, is one of the most popular and largest in the area, with a particularly high concentration of fashion stores and a good selection of food shops and cafés. St. Lukes is situated in the city centre and is without doubt one of the best places for retail therapy. Full of more than 100 shops, including fashion outlets, department stores and a large food hall, St. Lukes is well worth looking out for. 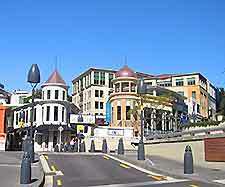 Located on the North Shore, the Takapuna Village is a popular mall with a good range of shops, restaurants and cafés. The Two Double Seven Mall contains numerous international fashion boutiques, jewellery stores, a food hall and grocery stores. Westfield Downtown, close to Pier 2 and Queens Wharf, features a post office, a pharmacy, gift shops, a food court and a convenient 24-hour grocery store.